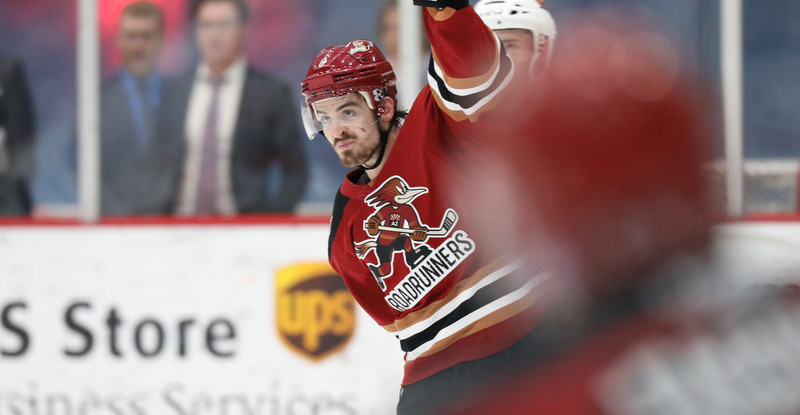 Conor Garland’s goal with 3.4 seconds remaining in overtime Friday night pushed the Roadrunners to a 4-3 victory in front of 5,650 at Tucson Arena. With the win, and coupled with the Colorado Eagles’ 3-1 loss to the San Jose Barracuda, the Roadrunners have moved back into a playoff spot, reclaiming fourth-place in the Pacific Division. Garland finished the night with three points (2G, 1A), and now has a total of four in two games back with the Roadrunners. 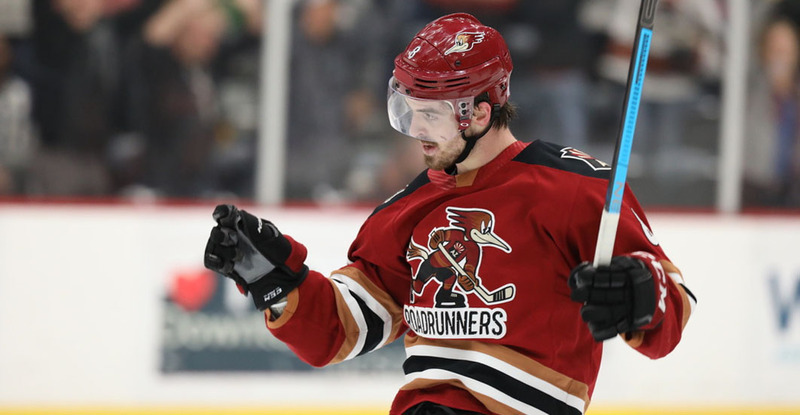 The Roadrunners got on the board less than three minutes into the game when Lane Pederson deposited a wrist shot from the top of the right circle during a power play, giving Tucson an early 1-0 lead. Pederson’s goal was his 22nd of the campaign; he is now one shy of matching the single-season franchise high mark of 23 set by Michael Bunting and Mike Sislo during the 2017-18 campaign. The Gulls tied the game, 1-1, just over a minute after Pederson’s opening tally. Moments later, Garland struck for his first goal of the night, scooping up a loose puck deep in San Diego territory before walking in alone to bury a backhand, giving the Roadrunners a 2-1 advantage with 14:03 left in the opening frame. San Diego would once again tie the score, 2-2, with 13:15 left to play in the second. Just prior to the game’s midway mark, Michael Chaput struck to give the Roadrunners their third lead of the game, 3-2, when he one-timed a Pederson feed into the net with 11:24 remaining in the middle frame. Chaput’s goals was the Roadrunners’ second of the night on the power play. The team now has 14 power play goals in its past 12 games. For the third time, the Gulls would counter, tying the game, 3-3, with 20 seconds remaining in the second. Neither team would score in the third period; the teams registered an even nine shots apiece during the final 20 minutes. In the waning moments of overtime, Garland retrieved the puck from the far blue-line, sped through the neutral zone to drive wide left upon entering San Diego territory, and beat Kevin Boyle with a shot low from a tight angle to secure the 4-3 win with 3.4 seconds showing on the clock. The teams will meet for a rematch Saturday night at Tucson Arena, the final game of the regular season; the game is scheduled to start just after 7:05 PM.